flaring from atop his head. conducting electrical operations - even supervising nuclear power plants. --From the NES Mega Man instruction manual. Dr. Light and Dr. Wily were partners, working together on a new robotics technology. Together they create Protoman, the first of the Robot Masters. After Protoman, they create six other robots designed to aid society. Dr. Light then created Rock and Roll to act as household aids to him. Because of this technological breakthrough, Dr. Light was given the Nobel Prize. Now, Dr. Wily, jealous and infuriated, stole the six robots made for society and reprogrammed them into robotic warriors to terrorize the public. As a last act of desperation, Dr. Light changed Rock into a super combat warrior named Mega Man to combat the six robots and stop Dr. Wily. Mega Man is the first in a classic series of video games that had more sequels than Rocky Balboa (And now Pongo's review of Rocky Five..... thousand). The graphics in this game were revolutionary and only get better as you go up in the series. The music in this game had a futuristic feel to it, albeit 8-bit sounds, but definitely keeps the game exciting and has become as classic as the video game itself. All in all, this is a classic game that deserves to be played over and over again, and if you like this one, then don't hesitate to play all the others that we offer. Lock and load, and Good Luck! Mega Man is a platform game that took platform games to a whole new level. You play Mega Man (A.K.A. Rock) as he goes through six levels to defeat six robot masters that have been stolen and reprogrammed by Dr. Wily. These Robots are Cut Man, Guts Man, Ice Man, Elec Man, Fire Man, and Bomb Man. Each Robot has a distinct weapon that it uses to fight Mega Man. This was the first game to feature the ability to absorb enemy powers after you defeat them. You steal each boss's special weapon, which you can then use yourself by selecting it from the Menu. Each weapon is useful in different circumstances. 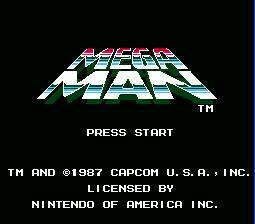 Mega Man was also the first game that allows you to choose which stage you play first. Fight through each stage by jumping, climbing, and defeating lesser robot minions of the robot master, until you come to the robot himself. Fight each robot master and take their power. Each robot master is vulnerable to a specific weapon, it's up to you to find out which weapon kills which robot quicker. Along your way you will find power-ups in the stages that restore you life and secondary weapon power. Your life is located on the left hand side of the screen and when it's gone, you blow up in a dramatic explosion. After defeating the six robots, you then go to Wily's castle were you must fight three more robots: Rock Monster, Copy Robot, and CWU-01P. Finally you must face Dr.Wily himself in his hover machine. So get out there and defeat Dr. Wily and save the world! When using a weapon that goes through an enemy, press the Select button (this pauses the game with out bringing up the weapon menu) when the weapon is making contact with the enemy. While the game is paused this way the enemy will continue to flash. When the flashing has stopped, press the Select button again to un-pause the game and the weapon will 'hit' the enemy again causing more damage. You can do this trick repeatedly with many of the bosses, making them very easy to beat.